Best Mattress for a Herniated Disc: Lumbar, Cervical Problems & More! Best Mattresses for Herniated Discs, Lumbar & Cervical Problems! Herniated discs are some of the most painful, immobilizing health conditions that can afflict a person. When the center of a spinal disc ruptures, it causes immeasurable discomfort. Slipped or bulging discs, as these are also known, radiate pain throughout the body, especially in the lower back, and can be crippling in the extreme. ​So, are you looking for the best mattress for herniated discs? Awesome ones for your lumbar problems? A comfortable one for your cervical issues? Then you came to the right place. Thankfully, the vast majority of herniated disc symptoms can be treated without spinal surgery! In fact, a lot of lower back pain related to discs and spinal health are a direct result of lifestyle elements like the quality of your mattress, your posture, and other physical aspects. So, not only will a good bed alleviate the symptoms of your herniated disc, it can be one of the most important elements of resolving the problem and getting you back to optimal spinal health! In this guide you’ll learn all about which mattresses are best for herniated discs, and how to shop with your condition in mind! Herniated discs can be caused by lots of different factors, such as traumatic injury, or weakened bone heath. Poor lifting posture or “pulled” back injuries can also cause these conditions. However, the most common cause is pressure placed on the spine through poor posture, extended sitting without core engagement, and insufficient support while sleeping. If your mattress doesn’t support your lower back properly, or if it’s too firm to contour to your hips, it can cause exaggerated curvature. That places pressure on your discs and the connective tissue, which leads to herniated discs and other back pain. So, it’s essential to find a bed that can support you properly and maintain a straight, stress-free spinal column. 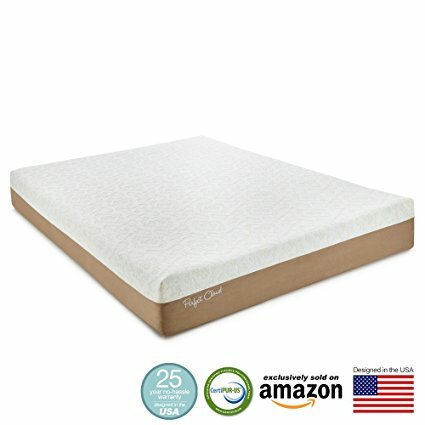 This Perfect Cloud mattress has lots of features to love, all for a very budget-friendly price. While it’s not the cheapest bed on the market, we know that folks with herniated disc issues can’t compromise on pressure relief or spinal alignment. That’s why we went to a slightly higher price point for our budget recommendation that we have in some of our other guides. The Perfect Cloud is the least expensive cushion that we think has the sheer depth and comfort to alleviate and realign your spine. It’s funny sometimes that people look for the best sleeping position for a herniated lumbar disc but when all they needed was a very good and comfortable mattress to sleep on. It’s a relatively thick cushion for a budget price. The Perfect Cloud is a full 10 inches, which gives it the depth to be compatible with side as well as back sleepers. That extra depth also gives it room to have a layered design that you don’t get on smaller budget beds for lumbar and cervical problems. Inside the mattress, there are 4 different layers. The top layer is a 3” comfort layer of gel foam, which adapts to your contours like memory foam, but springs back to support your torso and facilitate movement like latex. It’s cooler than either memory foam or latex, too. In the middle is a 3” layer of air channel foam for extra ventilation and cooling, which also contours slightly to accommodate for side sleepers. Underneath everything is a 4” block of structural support foam to keep you all lined up. Overall, we think the construction gives you a good balance of support and cushion. While there’s a relatively large amount of comfort foam, the fact that the top layer has gel integrated in it means you don’t just sink in as you would with softer, traditional memory foam mattresses. There’s room for side sleepers to sink in, but the gel layer buoys back sleepers and supports the torsos of side sleepers. Reviewers with chronic back pain, lumbar, disc and spinal conditions said that they slept well on this bed when many others had caused them agony. In fact, both side sleepers and back sleepers with chronic issues like herniated discs said the Perfect Cloud provided excellent relief. All of the foam components used in this mattress are CertiPur US-certified. It’s covered by a 25-year warranty, and Amazon’s standard 30-day return/trial period. It may be too soft for some folks, especially heavier back sleepers. This is a medium-firmness mattress, so it may not have quite enough support for everyone. However, most back sleepers said that the gel comfort layer kept them supported evenly along their spine. Even the cheapest of our recommendations will cost you close to $500. That’s a pittance compared to big box store brands, but it’s certainly not the cheapest factory-direct bed either. Be aware that if you have herniated disc issues, you should be prepared to spend slightly more than average for your cushion. It’s pretty stinky. Even though the Perfect Cloud is certified to be free of the most harmful chemicals and off-gassing, it produces chemical odors out of the box like any memory foam product. Be prepared to give it at least 24 hours to breathe, somewhere with good ventilation. This is definitely one of the stronger-smelling mattresses we’ve reviewed. As with a lot of Chinese-made beds, quality control isn’t super consistent. Some buyers received mattresses that didn’t expand evenly, or completely. The Dynasty Mattress Cool Breeze is a medium firmness with lots and lots of comfort features. Its our recommendation to side sleepers with herniated discs, as well as people with disc pain who simply prefer a deeper, more cushioned bed. It’s the most luxurious of our three recommendations by far, and it gives you a full 14” of cushion for only about $100 more than the Perfect Cloud! So, looking for the best mattress for disc problems? This could be it for you! It’s a thick, deluxe bed. The Dynasty Mattress is the thickest cushion here by 4”, and one of the deepest on the market period! That’s lots of room to pack in comfort features and extra support. If you’re looking for resort-like relief and pampering, reviewers say that’s exactly what you get with this bed. 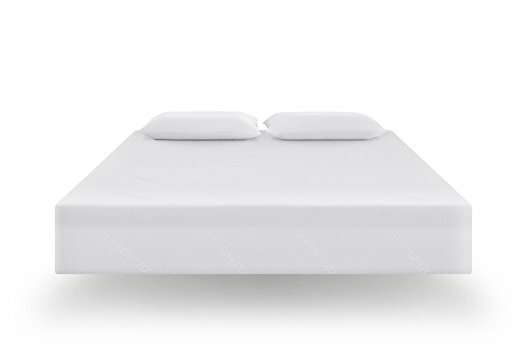 This is especially worth it if you have lumbar or cervical problems, the foam in the bed can definitely aid your pain every single night that you use it up to the point that it is completely gone. The top 5 inches of the bed are made up of comfort foams, first a 4” gel layer and then a high-density memory foam layer for the last 1”. That’s enough cushion to satisfy just about anyone. Even though it has a full 5” of comfort foams, it’s not too soft that it lets you spine curve or collapse. That’s because the top 4” are gel foam, which has the springy and supportive qualities of latex, as opposed to super-squishy memory foam. It’s so comfortable to sleep on that you don’t need to know how to sleep with a bulging disc. You just go to sleep. That’s it. Under the comfort layers, there are dual 2” slabs of airflow support foam, which keep your spine lined up while also providing some ventilation. We’re pleased to see that the Dynasty Mattress isn’t all cushion. It has these two air-support layers, and then a further 5” of high-density support foam underneath everything. The Dynasty Mattress is better for side sleepers than the Perfect Cloud, thanks to the extra depth and comfort layers. That’s an assessment that’s confirmed by side-sleeper reviewers who tried both beds. It also earns high marks from back sleepers, since the gel comfort foam on the top of the mattress is much less “quicksand-y” than traditional memory foam comfort layers. It gives ample relief to shoulders and hips, but supports your lower back and torso properly to keep your spine even and pressure-free. It sleeps relatively cool, like the Perfect Cloud. Most previous buyers thought that the gel comfort foams and the ventilation channels did their job particularly well. It’s not much more expensive than the Perfect Cloud. It comes with a 120-day comfort trial and a 20-year warranty! This is the softest of our recommendations, so heavier sleepers, especially back sleepers, may find that there’s not quite enough support. If you’re an average weight side sleeper or a lighter back sleeper, you should be perfectly comfortable. As with the Perfect Cloud, some reviewers found it rather smelly. You’ll want to air this out for at least 24 hours, but some buyers found they couldn’t deal with the odor. A few reviewers didn’t think the cooling features worked very well. They said they slept too hot, and got sweaty. That’s one common problem of deep, soft beds like this, even though most buyers said the Dynasty Mattress was relatively cool. Buyers had mixed experiences with durability and customer service. While most reported that their beds were holding up well over years of use, some said that theirs developed lumpy spots and dips where the foam had sunk down. Some were able to return their mattresses for a refund, while others were told the dips weren’t significant enough to warrant a claim. Our top quality recommendation for sleepers with herniated discs is the Tuft & Needle. It’s a huge seller in the sleep industry, and an incredibly well-liked mattress. We think it’s a good choice for disc and spine issues because it’s quite firm, and gives your spine lots of support and alignment. There’s a reason why we think this is one of the best mattress for a slipped disc. Keep reading on to find out why we think that. It’s the firmest mattress of the three. The Tuft & Needle is somewhere between medium-firm and firm, which is our ideal zone for spinal alignment for most people. It’s absolutely ideal for back sleepers, who require extra support under the torso. 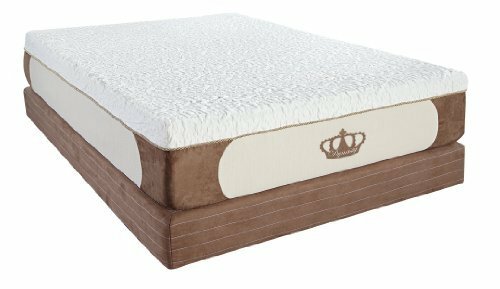 It’s still soft enough for most side sleepers, though, and it receives extremely high comfort marks from reviewers of all sleep positions. It achieves its near-universal comfort zone through two layers of proprietary foams. The Tuft & Needle isn’t exactly memory foam, and it’s not made from traditional latex materials either. The company doesn’t give lots of details about their proprietary materials, but the upper 3” are made from an adaptive comfort foam similar to memory foam or latex, but with integrated gel and charcoal for heat distribution. The lower 7” are a sturdier support foam to align your spine and keep you from sinking in. The foams are also notable in that they’re not only CertiPur US certified, but free of chemical flame retardants, and glued together by OEKO-TEX certified bonding agents. Oh, and it’s all made in the USA! Reviewers said that while they still felt cradled by the foams, they didn’t get the sinking feeling they experienced on other beds. We also found that most people complimented the way the Tuft & Needle aligned their spine and kept the torso from curving downward. Many reported that their hip and back pain issues were resolved after they started sleeping on this! It’s incredibly popular. That’s not always a sign of quality, but the staggeringly high percentage of 5-star reviews on the Tuft & Needle all over the internet, from so many buyers of all different sleep styles, speaks for itself. These mattresses might not be quite universal, but they’re close to it! If you enjoy a medium-firm to firm bed, you’ll almost certainly like this one. It comes with a fantastic comfort period lasting a full 100 days, and a 10-year warranty. Previous buyers also had rave reviews of Tuft & Needle’s customer service in the case that they received slightly dysfunctional beds, or found that the firmness level wasn’t quite right for them. The company responded swiftly and promptly, and went out of its way to make things right. With something as important as a mattress, and a condition as severe as a herniated disc, that counts for a lot! Even the best of our recommendations is relatively cheap. This cushion is only slightly more expensive than the Dynasty Mattress, and it’s much more comfortable and durable. It has a reputation for being fairly firm. Some of the older reviews of the Tuft & Needle were from buyers who couldn’t deal with how firm the bed was. The latest version is slightly softer, but it still gets mixed responses. While many people found that the newer version was more comfortable, some original buyers who came back for a second bed said that they thought the new one was too soft. The current version is certainly softer than the original, but it’s one of the firmest foam mattresses on the market right now. It’s supposed to be one-size-fits-all, but that’s unrealistic, especially when you’re shopping with an acute condition in mind. That’s why we like the long comfort guarantee on this model–it gives you plenty of time to test it out without any financial risk. Even though Tuft & Needle have a much better than average reputation for quality control and service, they’re not perfect. A few buyers reported receiving mattresses which expanded wonkily, or beds with particularly strong odors. However, the company was quick to respond with replacement and refund offers, and most buyers still gave the cushion very high marks once they received a proper model. The key to sorting out your disc issues is to find a sleep surface that keeps your spine level and relaxed, so there are no curves or pressure points to cause pain or misalignment. We recommend that back and stomach sleepers choose a medium-firm or firm mattress. You’ll want just enough pressure relief to keep your hips and shoulders cupped and comfortable, without letting your back curve. Side sleepers should usually choose a medium-soft or medium firmness bed, to allow their shoulders and hips to sink in slightly further. However, some heavier side sleepers may find that a medium-soft or medium mattress won’t support their midsection properly, so we recommend that those buyers err on the firmer side to ensure that torso support. Otherwise, you could end up with some spinal curvature and pressure. Be careful to strike the right balance between cushion and support. If you’re already experiencing back pain, it may seem like the right decision to buy a softer mattress. However, if you don’t opt for something with enough support, you’ll only exaggerate your disc issues! So, think about your spinal alignment first, and then about the “comfort” layers and materials in your bed. In most cases, we like to see 2/3+ of the cushion made up of a structural foam to align the spine, with the upper third for comfort and pressure relief. For some side sleepers and larger people, that ratio may be more like 50-50, depending on the thickness of the mattress. We hope you’re at least one step closer to finding relief for your spinal symptoms after reading this guide! If one of our recommendations strikes you as the perfect fit, click through to Amazon to see all the details! You can check current prices, compare dimensions, and see lots of feedback from fellow buyers. Still looking for your new sleep surface? Head over to our home page to see all our other favorites! Now that we’ve had a close look at all of our favorites, let’s figure out which one you should buy! If you’re on a relatively tight budget, the Perfect Cloud is the least expensive mattress here by at least $100. It has a respectable balance between cushion and structure, and it sleeps cooler than other beds under $500. However, it’s pretty smelly, it’s only a medium in terms of firmness, and it doesn’t have great quality control. For the most luxurious, padded sleep experience, get the Dynasty Mattress. It’s not quite as well-reviewed or universal in its appeal as the Tuft & Needle, but for people who find the best relief with a super cushioned bed, we don’t think you can do much better. Unlike other luxuriously thick cushions, the gel upper layers keep your spine supported enough to reduce herniated disc symptoms. It may be too soft for you, though, so we mainly recommend it to side sleepers and those who know they like a plush mattress. To get the best balance of support and structure for nearly every sleeper, go for the Tuft & Needle. We think it’s the best choice for just about anyone with a herniated disc, especially back and stomach sleepers. The vast majority of side sleepers will find it comfortable as well. It’s simply the best bed for herniated discs, and we think it’s well-worth the extra cost over our other recommendations.